Hello everyone. My name is Tyler Cruz and this is my first-ever guest blog post. I run a blog at TylerCruz.com which I started back in October 2005, just two months before John Chow started his. In fact, I’ve known John since before (right before) either of us even had blogs, before he became famous and an internet celebrity. My blog chronicles my day-to-day operations as a web entrepreneur and someone who makes their living entirely from the Internet. While more relevant today in 2012, it was a bit more interesting in 2005/2006 as making money online wasn’t so ubiquitous as it is today. I’ve been making money online for a living now for around 8 years. I’ve had many successes and many failures. I’ve made money online from a variety of different methods including: ad income from websites, website selling/flipping, domain flipping, and commission-based sales. One method of making money online that has always intrigued me however, was affiliate marketing. It has always intrigued me because I saw people posting screenshots of their earnings from affiliate marketing, and it always astounded me how much money they were making. I saw people posting screenshots of their accounts, making $50,000 or $75,000 or even $100,000 and higher a month. This just floored me and I’ve never been able to get affiliate marketing off my mind since. The potential income was just too great. I just finished doing a search on my blog, and found that April 23, 2007 was the exact date that I decided to give affiliate marketing a shot myself. As you can see, it did not go very well. In fact, it was rather disastrous. I spent $1,186.20 to make $84, resulting in a net loss of â€“$927.70. But that very first lead I made on April 27th, 2007 gave me a high like there was no tomorrow, and I was hooked. My results didn’t improve anytime soon, but I kept at it. Fortunately, affiliate marketing was just something I was trying on the side, and I was still making good money from other online endeavours, primarily my content-based websites. This allowed me to keep trying my hand at affiliate marketing. One year later, I finally managed to finish a month with a tiny bit of profit. While I basically broke even, it was still progress nonetheless. I continued to try affiliate marketing off and on, always doing it on the side of everything else I was doing, and often going half a year without doing any work on it at all. It was frustrating to see others pull in such huge numbers when I was struggling just to break even. 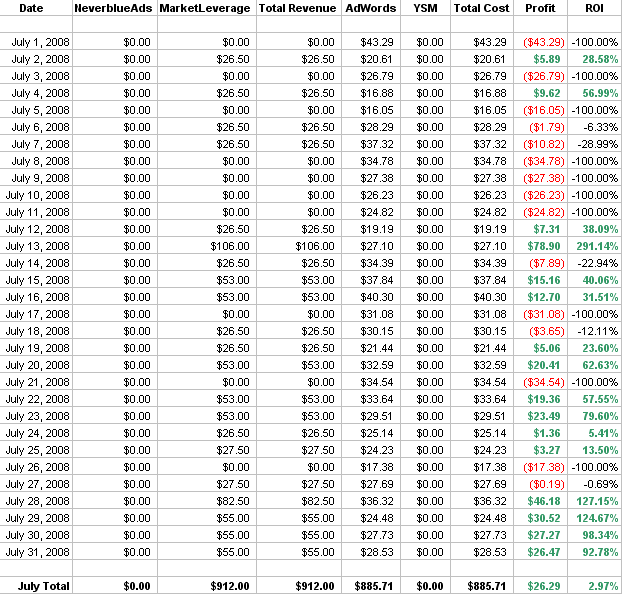 By February 2009, I managed to finish the month with a net profit of $511.49 and ROI of 28.01%. It was great to finally see a good month. While I was only making in a month what others were making in a day, it was still a good feeling to know that I was finally able to make affiliate marketing work after all of my prior failures with it. I ended up netting just over $1,000 that month. Unfortunately, that particular campaign I was running proved to be quite unstable, and the following month I once again ended up in the red by around $600. It was frustrating to see success with affiliate marketing, only to have things turn upside down the following month. It seemed to be a coin flip, and I wasn’t really getting anywhere, basically just breaking even in the long run. With affiliate marketing taking up a lot of my time, and due to my very mixed success with it, I took quite a long break from it, only leaving some of my campaigns run on auto-pilot. I tried a few new things here and there, but basically just left it on the backburner for the next year and a half or so. I’m not sure what prompted me to do it, but in November of 2011, I decided to give affiliate marketing yet another try. This is something I kept doing off and on ever since I started that day on April 23, 2007, and so I guess I just figured it was time to give it another go. I think in the back of my mind, I still remembered seeing those screenshots of guys pushing 5-6 figures a month, and it was just something I couldn’t stop dreaming about. And so, back to work on new campaigns I went. Things started off a bit roughâ€¦ I had numerous days of finishing in the red again. But at the same time, I saw a lot of potential is what I was doing, which made me excited. It took a lot of work and a lot of optimizing, but after a few weeks, I finally polished my campaigns to where I was netting around $100/day profit. What was great was that there was still so much to test and optimize, which meant a lot of growth possibilities. I kept working hard on my campaigns, basically spending the majority of my working hours on them, and by December 2011 I had my campaigns going quite strong. In fact, I was setting and breaking new personal records on almost a daily basis. On December 17th, 2011, I set a new personal record by netting $590.72 in profit from my affiliate campaigns. On December 19th, 2011, I set another record by grossing $1,276.50 in a single day, and on January 2, 2012, I set yet another personal record by grossing $1,500 in a single day! It was amazing. It just goes to show how quickly things can change in affiliate marketing. Two months prior, I was still in the red, then just 60 days later, I was hitting days as high as $590 net profit a day. But alas, affiliate marketing is indeed one long roller coaster, and the ride will repeat itself. The next 3 months were very slow for my campaigns, as I ran into a number of obstacles such as offers dropping, pay decreases, and increased advertising costs and competition. But I wasn’t giving up â€“ oh, no. The tremendous growth and success I saw in November and December of 2011 only fuelled me to keep trying further. It took a little while to get things going again, but on April 29th, 2012 I set another new personal best, by grossing $1,671.82 in a single day. I was back, and it felt good! What’s crazy is that a couple days later, I completely smashed that record by grossing $2,341.10 in a single day! $581.25 of that was profit in case you were wondering what my profit margins were like. Over $4,000 in a Single Day! On May 12th, 2012, my campaigns grossed a total of $4,070.00 in a single day. $1,778.56 of that ended up being profit. On June 11th, 2012, around 5 weeks ago, I was encouraged to try advertising on Facebook from a super affiliate friend. I had tried it a few times before, but had always had terrible results. But my friend was seeing enormous success with it and I had learned a few things since I last tried it, so I decided to give it another go. I found another good traffic source to scale my campaigns. Woohoo! I’m One of Those Guys! As I write this, my campaigns have currently grossed over $3,000 for the day, and the day isn’t even over yet! 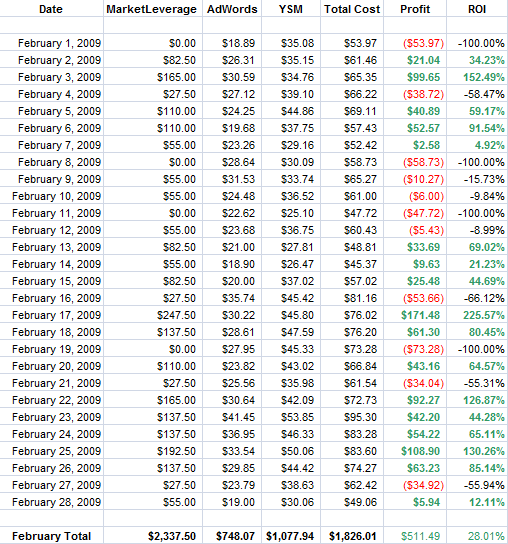 As you can see, I ended up grossing $122,471.85 in less than 2 months! Suddenly, I’m one of those guys posting the 6-figure screenshots â€“ the very ones that inspired me to give affiliate marketing a try in the first place. The feeling is a bit unreal, and to be honest, these numbers have only whetted my appetite to grow my campaigns even further. I now want to work on getting my net profit up to $30,000 a month (and beyond). The sky’s the limit. What’s scary is that compared to some other affiliates, what I’m currently generating is miniscule in comparison, and so the desire to keep growing continues. To some, it may seen like this post is just about me bragging about my recent success in affiliate marketing, or that I’m about to pitch some e-book or product to you. If that’s what you thought, you’re wrong. The point of this very long-winded post is to never give up and to persevere. I first started trying affiliate marketing on April 23, 2007, but I didn’t see any real notable and consistent success until November of 2011 â€“ over 4-and-a-half years later. If I gave up after my first attempt and never tried again, I’d never be seeing the numbers I am today. Granted, I had funds from other revenue sources that made it easier to keep trying, but it’s not like most of you don’t have revenue from day jobs that you could use. And yes, my campaigns could fizzle out again, but even if they do and I never get them profitable again, the fact remains that I did manage to grow them to huge numbers and overcome my past failures, and that can never be taken away from me. Affiliate marketing also has a fair bit of luck involved. Sometimes you just get lucky and will find a particular offer and particular traffic source that work â€“ but the only way to know is to keep trying. Failure is fine as long as you learn from your mistakes and gain knowledge and experience. Obviously this doesn’t just pertain to affiliate marketing, but rather anything in life. I know a lot of you are reading this post aren’t actually making any money online. There are a definitely a lot more ‘readers’ than ‘doers’ in this world, and a lot of people unknowingly live vicariously through others, whether it be the singers on American Idol or John Chow on the Internet. While it’s great to dream and envy others, it’s even better to succeed yourself. Don’t give up, and keep at it. This may all sound very lame, but the fact remains that you can’t succeed if you give up. If you enjoyed this post, be sure to check out my blog at TylerCruz.com. I am also active on Twitter (@tylercruzdotcom), have an RSS feed, and newsletter on my site.